Kibana is one of the Elastic products, part of the Elastic stack (formerly known as ELK). 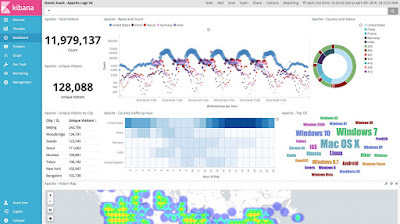 Kibana is a an open source web app written with Angular and running over a thin Node.js server (which acts as a webserver). Kibana is able to connect to a single Elasticsearch node. It's possible to put a load balancer to several nodes, but the best practices suggest a Coordinating or a Tribe (deprecated) or a Cross-Cluster node (in case you need it). Keep in mind: Kibana has no actual reason to exist without an Elasticsearch cluster to connect to. The opposite is not true: Elasticsearch can live on its own and be quite useful without Kibana and can be even connected to Grafana if you really need visualizations. Kibana has very little local state/persistence: the configuration files and some cache files. It completely relies on Elasticsearch for most of the features (e.g. authentication if you own X-Pack) and for storing all the data required to run. Kibana provides a cool interface to build dashboards. The dashboards are made up of several visualizations. A visualization can be something static (a Markdown field to show some comment or help message) or dynamic (a pie chart, a table or a histogram). The dynamic visualizations gets generated from the data retrieved from Elasticsearch. The query to Elasticsearch is normally generated behind the scenes thanks to the UI. It's possible even to write your own query and use the output in the visualization. The queries targeting Elasticsearch are most of the time aggregations. A visualization typically refers to data fields exposed by an a index pattern. What is an index pattern? Let's talk about index templates first. If you are familiar with the Elastic stack, you've probably heard about index templates. Index templates are one of the key parts of the Elasticsearch configuration. An index template is not able on its own to enumerate all the fields present in an index. The only way to get them would be to perform a GET on an index, but you cannot define how Kibana should consider it. Index patterns to the rescue! An index pattern tells Kibana the fields you can query and what is their type. It's important to trigger a refresh of the index pattern if fields in the targeted index (or indices) have changed (added, removed or change of type occurred). What happens if you want to export a single Dashboard? Unfortunately, there's no way to ensure this will not break in the near future. Kibana will have multi tenancy? Elastic has written a post on Kibana internals on 2016, worth taking a look. There's no silver bullet solution to move your dashboard out from your cluster in a future-proof manner.